We know deciding on your wedding and reception venue can be a tough choice. There is a lot to consider. But if our domes have caught your attention, take a look at the most common questions and answers for brides-to-be. "I love the domes, but where would I put one?" We can assemble the domes in almost any space big enough to take them (with a few common sense caveats, like access for our vans and level ground with good drainage). It could be a big garden or a space hired specially for the occasion. You can find a few of our favourite venues in the South West here to give you some ideas. 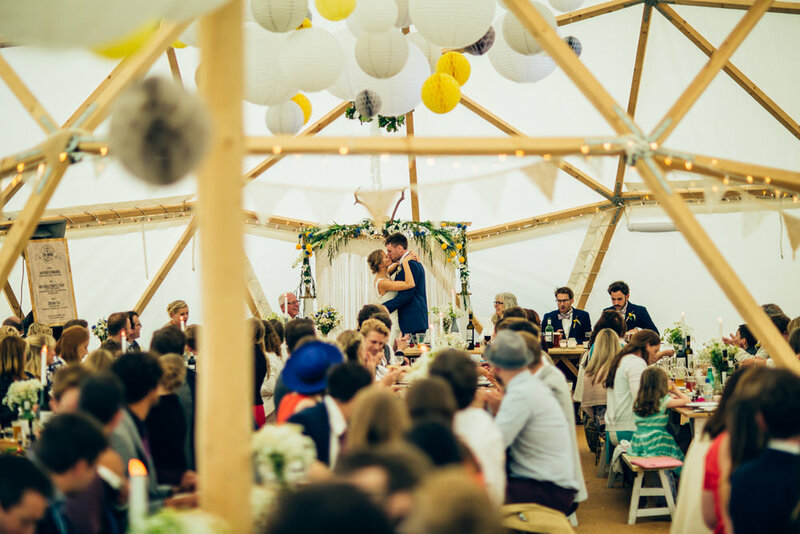 "We want to get married in the Autumn...does that mean a dome wedding is off the cards?" Not at all. We’ll just need to bring in some extra heating! If you have your heart set on a particular location and a particular time of year, just let us know and we can talk about the options. "Can we have the ceremony in a dome?" If the location you’ve chosen is licensed for marriage ceremonies then absolutely. This wouldn’t typically be the case for a garden in a private home, but it is common for venues that host weddings to have a marriage license. "How many domes would we need?" A single dome can take 100 people seated and up to 300 standing. Add on the sail and it’s 180 seated and up to 400 standing. With the double dome you can seat 200 and have over 400 standing. So plenty of options. Couples typically spend between £5,000 and £8,500 with us, depending on the number of domes and configuration. These prices include furniture hire, flooring and lighting. "What’s included as standard in the dome hire and what would we need to source elsewhere?" Baya hire includes the dome(s), tables, benches, matt flooring, timber bar, internal uplighters, spot lighting and external festoon lighting. You would need to think about sourcing the power supply for lighting, any heating and catering (typically a hired generator), provision of toilets, catering, decor, dance floors, flowers...and anything else you’ve set your heart on! See the checklist below to get you started. "Would you talk to / liaise with other suppliers?" Of course. We are happy to work with wedding planners or event managers at locations to answer any questions they might have and to make sure things run as smoothly as possible. "How long would we have the dome(s) for?" We usually set up the domes two days before your wedding and take them down one or two days after. Just talk to us about what you need and we can make the set up and take down process works for you. "Do you offer any wedding planning services?" Sadly not! We are used to working with wedding planners but don't provide this service ourselves. "Are there any restrictions on how we decorate the dome(s)?" We can't have anything too heavy hanging from the timber frame, or hang anything that will leave marks or cause damage. But as you will see from our gallery, there is plenty you can do to personalise the space and add some magic. Talk to the Baya team to check availability and to talk through your requirements (click here to get in touch). Think about a suitable location for the dome(s) and make enquiries (we can point you in the right direction). With the right team on board you will be on to a winner! Click here to get in touch about your day. Older PostDouble Dome at the Oxford and Cambridge Boat Race!